Associating genetic markers with a multidimensional phenotype is an important yet challenging problem. In this work, we establish the equivalence between two popular methods: kernel-machine regression (KMR), and kernel distance covariance (KDC). 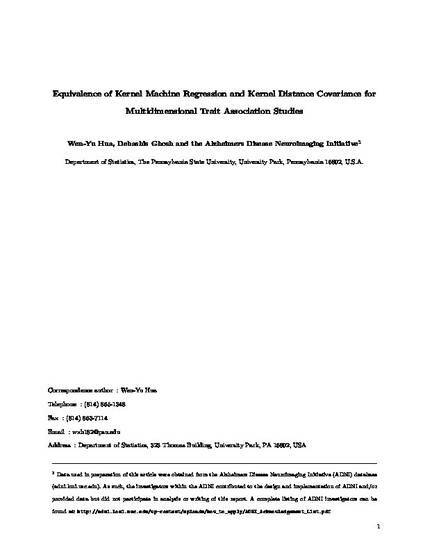 KMR is a semiparametric regression framework that models covariate effects parametrically and genetic markers non-parametrically, while KDC represents a class of methods that include distance covariance (DC) and Hilbert-Schmidt independence criterion (HSIC), which are nonparametric tests of independence. We show that the equivalence between the score test of KMR and the KDC statistic under certain conditions can lead to a novel generalization of the KDC test that incorporates covariates. Our contributions are 3-fold: (1) establishing the equivalence between KMR and KDC; (2) showing that the principles of KMR can be applied to the interpretation of KDC; (3) the development of a broader class of KDC statistics, where the class members are statistics corresponding to different kernel combinations. Finally, we perform simulation studies and an analysis of real data from the Alzheimer's Disease Neuroimaging Initiative (ADNI) study. The ADNI study suggest that SNPs of FLJ16124 exhibit pairwise interaction effects that are strongly correlated to the changes of brain region volumes. Distance covariance; Hilbert-Schmidt independence criterion; Ker- 1 nel machine regression; Kernel distance covariance; Genetic association study; Score test; Permutation test. This is an earlier version of the paper; the current one can be found at the Biometrics website.